A unique cabin in Denali National Park and the Alaska Range. One of the most distinctive and historic structures in Alaska is Don Sheldon's Mountain House, overlooking the Don Sheldon Amphitheatre at the top of the Ruth Glacier. Our Mountain House air tour gives the passenger a good look at both the amphitheater and the spectacular Ruth Gorge. This route is the basis for all Sheldon flightseeing tours. Departing from Talkeetna you will experience the vast river and forest lands - home to Alaska's wild game such as black bears and moose - on the short trip over to the Alaska range. In addition, there are occasional lodges to be sighted along the lake shores, often only accessible by float plane. Sheldon Air Service's pilots are intimately familiar with this country and will point out sights on the way, as the terrain gradually changes through the foothills of the Alaska Range. Every passenger gets a headset and can converse with the pilot while in flight. Denali is so massive that it won't appear to get closer until you are past the foothills and flying up the Tokositna Glacier. Off to the left will be Little Switzerland, a popular destination for both technical climbing expeditions and fun day trips. Next you climb over the Tokositna Glacier as it winds toward Denali, flying within six miles of the massive summit. 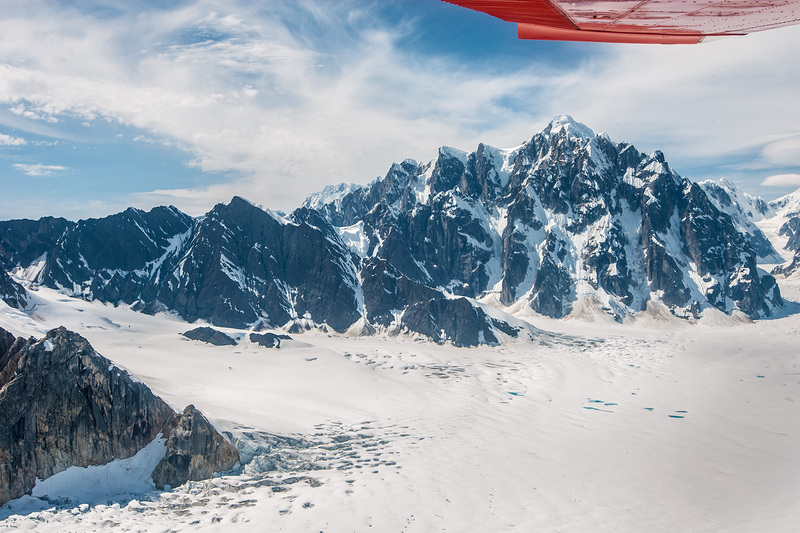 The 'Tok', as it is popularly called, is a relatively small glacier on the southern approach to Denali, however it gives the passenger a great sense of how the majestic topography of the Alaska Range generates ancient glaciers. After a run through the 747 pass, you turn up the head of the Ruth Glacier and land at Ruth West landing strip. When on the flight, at the head of the Ruth Glacier, you will marvel at the Don Sheldon Amphitheatre, named by the National Geographic Society, at the suggestion of Bradford Washburn. You will see Mooses Tooth, Bear Tooth and Broken Tooth peaks, popular climbing destinations on the far side of the amphitheatre. In the course of the climbing season, Sheldon pilots deliver and pick up climbing teams to the tiny landing area called the Root Canal. One of our 2012 teams made a cool video of their ascent of the Mooses Tooth via the Ham and Eggs route. An aerial view of Don Sheldon's Mountain House is the focal point of the Sheldon Air Service basic flightseeing tour. The Mountain House was build in 1966 by Sheldon as a climber refuge and private retreat and is a popular overnight destination. Reservations for the Mountain House are booked up to two years in advance, but you can land and see the location on any flight, any time of year. To top it off you will experience the majestic Ruth Gorge on the way back to Talkeetna. The Great Gorge, as it is sometimes called, is a mile deep in some places. The floor is the rugged Ruth Glacier. Watch for the brilliant pools of bright-blue glacier melt water. A landing at the peak-ringed Ruth Amphitheatre allows the flightseer to take the majesty of the surroundings into perspective and grab photos of the range. A glacier landing will add an extra half hour to the flight and is the highlight of any flightseeing experience. On the way back, the Tokositna River area at the base of the Alaska Range offers another opportunity to view moose and bears in their natural habitat.